The LADY & THE TRAMP Series was released in 1962 to coincide with the animated film's theatrical re-release. 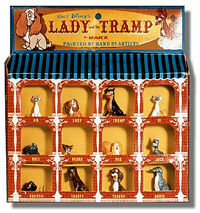 The 12 figures in the series were only available in the "Kennel Box" package. The figures of Lady and Tramp were in a different pose than those previously available in the "New" Disneykins line (Second Series). This unique set included the entire animal cast of the animated film, Walt Disney's LADY AND THE TRAMP. The alternate figures of Lady and Tramp are in a sitting position (in comparison with the Second Series' standing position figures). Although the individual figures occassionally turn up for sale or auction, this complete set in the box is hard to find. The figures are (from left to right, top to bottom): Am, Lady, Tramp, Si, Bull, Pedro, Peg, Jock, Dachsie, Trusty, Toughy and Boris. Click photo to view a larger version.